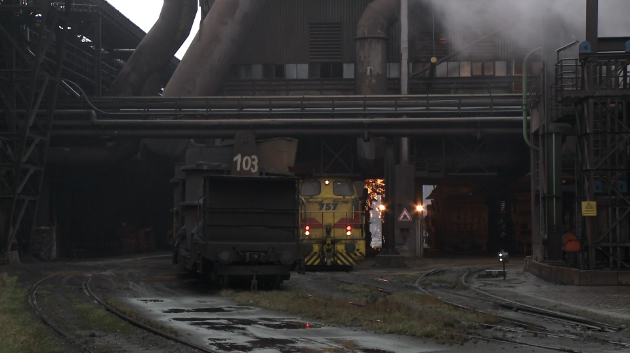 Watching Pig Iron, a 30 minute static shot of a German smelting factory in crisp HD commissioned by Jeonju Digital Project, makes you wonder about the effects the HD cinema has on experimental filmmaker giants such as James Benning. Benning shot all his films on 16mm film prior to Ruhr (2009), his first foray into HD and first film shot outside US. What HD affords him here is pretty epic. Known for his 'landscape' films where you hold a shot for a long period of time to have audience engaged and familiarize with its surroundings, had a limitation of 10 minutes- a 1,000' of film (maximum capacity in 16mm) runs out at around 10 min. It also gives you better latitude than a 16mm film stock in underexposed areas and a lot sharper than what 16mm lens are capable of. Pig Iron, when seen on a full screen in good resolution, is breathtaking: you can make out every grimy industrial details- gigantic, rusty airducts, sparks, smoldering heat (look at the pipes just above car 103), gaseous clouds rolling in from the sides, combined with Benning's precise framing and timing. Pig Iron is a great example of taking advantage of HD technology: as far as experimental filmmakers are concerned, they can't afford to create films such as Pig Iron in traditional filmmaking - hire train conductors, smelters, smoke machine, some extras in construction worker's garb and block the shot the way one wants precisely to a tee. Maybe this isn't the point and I am rambling here. But the film is so cinematic since its image quality is so superb. Why am I not making experimental films?